Drapolene Cream helps prevent and treat nappy rash without blocking the action of one-way nappy liners or disposable nappies. 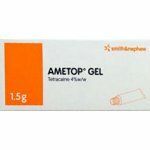 It is also used for the relief and prevention of urinary dermatitis in adults, and the relief of minor burns. Nappy rash is an unpleasant condition caused by moisture in diapers and nappies, especially when left on for too long. It can cause babies’ skin to look very red and inflamed and although it’s not dangerous at all, it can be extremely distressing. 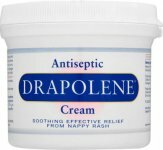 Drapolene is a specially formulated cream with a water miscible base and is specifically used for the treatment of nappy rash, and for soothing minor burns and wounds. 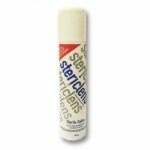 It contains gentle yet powerful antiseptics, which treat and prevent infection while soothing and relieving tender skin. The easiest way to prevent nappy rash is to use Drapolene for every diaper change and to clean and dry the area before applying Drapolene. 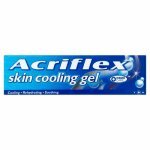 Drapolene Cream can also be used for the relief and prevention of urinary dermatitis in adults, and the relief of minor burns. Apply at each nappy change to clean dry skin, paying particular attention to the creases and folds. Apply regularly to clean dry skin. If the skin condition does not improve or worsens, consult a health professional. If you notice any side-effects, please speak to your doctor or pharmacist. Do not use this product if you have had a bad reaction to any of its ingredients. The colouring (Amaranth) may cause allergic-type reactions, including asthma. These reactions are more common in people who are allergic to aspirin. Use by date: Do not use after the expiry date on the label. Benzalkonium Chloride Solution 0.02% w/w (equivalent to 0.01% w/w Benzalkonium Chloride), Cetrimide 0.2% w/w, White Soft Paraffin, Cetyl Alcohol, Polawax, Chlorocresol, Amaranth (E123), Water.